The Textile Arts Center, the founders of which were recently interviewed by Sarah Scaturro in Fashion Projects, is hosting a collaborative exhibition by Kimberly Ellen Hall titled "Virgin Knitters." The exhibition is the documentation of a project started in 2007 for which Hall taught a number of people how to knit in exchange for their first project, a scarf. The project was inspired by the Buddhist notion of Wabi-Sabi, which can be partially understood as the appreciation of something specifically because of its imperfections. 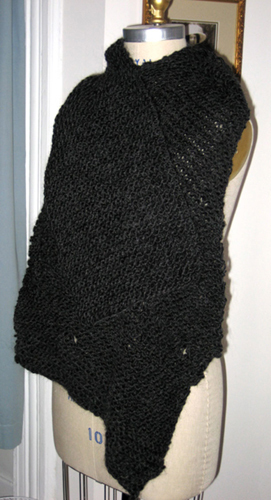 "The virgin-knit scarves have both an emotional and aesthetic appeal. A virgin-knit scarf draws in the wearer through the knowledge that the knitter worked hard making it, while the aesthetic appeal stems from the ideas embodied in Wabi-Sabi, a Japanese concept of beauty. The idea that there is beauty and power in an object that is not precision made or the result of years of experience seems an important one today. It's easy to agree that everything is mass-produced, cheaply/quickly made these days, etc.—an antidote to that can be found in craft. But we often find at the other end of the spectrum is artisanal and labored handwork that can be a put-off when deciding to learn to make something for the first time." Kimberly Ellen Hall is an artist and designer with an interest in the intangible qualities of textiles. She holds an MA in textiles from Central Saint Martins in London, and has designed on both sides of the Atlantic from Hussein Chalayan to Coach.